Luftwaffe night-fighters (Me 110s) first shoot down a British plane. President Roosevelt signs the ‘Two Ocean Navy Expansion Act’. This was the first step in preparing America for war against either Germany or Japan, or both. 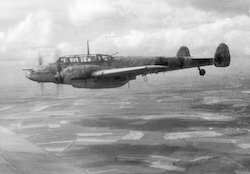 British claim 40 Luftwaffe planes down in a week; British civilian casualty figures for last month announced: 336 killed, 476 seriously injured. German aircraft sink destroyer Brazen off Dover. Stalin appoints himself Defense Commissar. USSR resumes diplomatic relations with German occupied countries. Stalin declares himself Soviet Defense Commissar. Orthodox Patriarch of Moscow, formerly an enemy of the state, makes radio broadcast urging resistance to Nazi invasion. 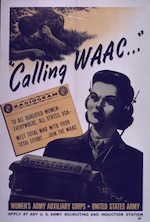 The U.S. Army Women’s Army Auxiliary Corps (WAAC) begins its first training class at Fort Des Moines, Iowa. Mussolini temporarily abandons his ‘Victory March on Cairo’ and returns to Rome. The Russians recapture the bridgehead at Voronezh on the Don. The Headquarters of MacArthur’s southwest Pacific theatre moves from Melbourne to Brisbane. US forms First Special Service Force (FSSF) under Col. Robert Frederick as a commando unit with both US & Canadian troops. The Italians surrender to U.S. forces en masse in western Sicily. The Canadians start to push around Mt. Etna as Catania drive falters. HMAS Hobart is put out of action by a torpedo attack from a Japanese submarine west of New Hebrides. Soviets order all partisans in German-occupied Europe to attack rail lines. Adolf Hitler suffers only minor cuts when a bomb explodes in the office of his Wolf’s Lair fortress. The bomb has been planted by Lieutenant Colonel Count Claus von Stauffenberg, who is caught and executed in under twenty four hours. Heavy rain for next two days ends operation ‘Goodwood’ after 413 British tanks are lost. French troops begin their withdrawal from the Italian front, ready for the invasion of Southern France.